I create maps, charts and sentences. My wonderful sister got married, so I got Amanpreet Singh to hand-letter everything on our latest collab. I'd say we outdid ourselves. My cousin's wedding gift, best coast looking its very best ✨calligraphy by the absurdly talented Amanpreet Singh, Blender relief only by the grace of Daniel Huffman's tutorial that I have to reference every thirty seconds even though I've done this a bunch of times, land cover colors whatever the heck I want them to be because it's my map. I was feeling wistful for NorCal so I loaded up Daniel Huffman's Blender shaded relief tutorial, went digging for land cover files, and label-futzed for a while. ❤️ you forever, Davis, CA. Germany is trying, like actively trying, to get to 80% renewable energy by 2050 without nuclear. Viel glück, buds. With Jason Treat, Ginny Mason and John Tomanio. Kiribati may be underwater in 100 years. An atoll, a culture, a people may vanish under the waves. Bathetic note: very impressed with myself for finding this land cover data in a real haystack of a neglected database. My added value: if the data for ____ exists, I will find it. Old pipes means many leaks; bad for water, worse for methane, which has high climate forcing potential and hey we spent all that money and time getting it out of the ground in the first place. This was cut from the Climate Issue package but I like the way it turned out! There are wolves in Canada that get most of their food from the sea; damp little guys scavenging roe and salmon, swimming between islands, it's nuts! With Martin Gamache and Matthew Twombly. Earth gets most of its calories from wheat, rice, corn and potatoes. Climate change will hurt production of all of these, and I don't think we can monoculture our way out of this one. With words by Daniel Stone and data wrasslin' by Ricky Robertson of IFPRI. 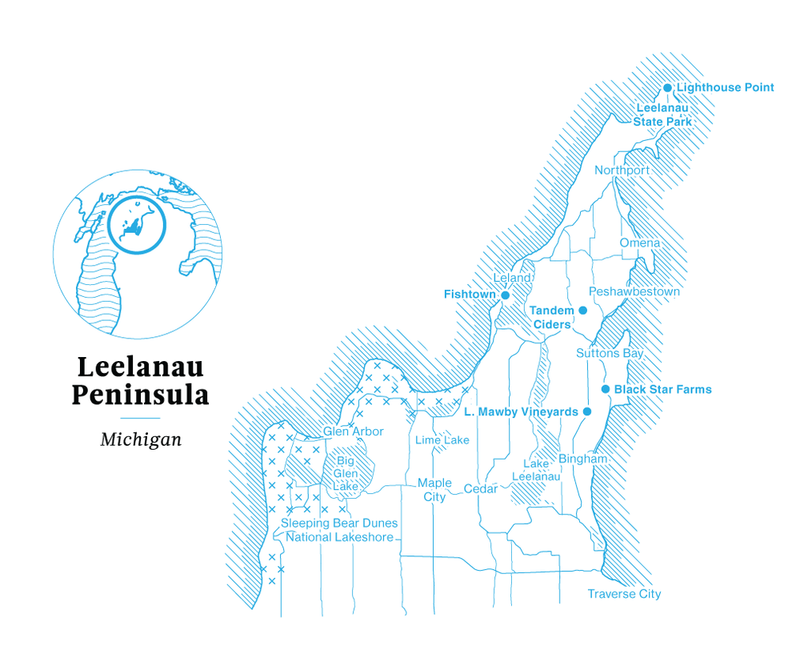 This won the 2015 North American Cartographic Information Society Student Map Competition; not too shabby for my first cartography class! QGIS, Photoshop, MAPublisher, Google Earth Engine and tears yielded a map of lovely Norcal. Fun facts about oil spills in the grand old U.S.A: there are fewer tankers getting cozy with reefs à la the Valdez, but there are plenty of other pollution sources to pick up the slack. Remember: where oil goes, spills follow. ★☆★☆RUNNER UP★☆★☆ at the 2014 CaGis map awards. Wholly necessary, endlessly derided, very unprofitable: an abortion provider is a very difficult business to run. Harsh math and cruel state laws have closed more than 160 providers nationwide, and not enough are opening to close the gap. Big ups to Esmé E. Deprez forever. The year is 2116. In the ruined husk of 731 Lexington Avenue, a fax machine clicks to life...our final transmission to the past. It contains this graphic on U.S. shale oil, which will probably be important. Heed us. Dig while the sun shines: in an effort to unshackle Greenland from its cruel Danish overlords, the prime minister is all about the bright side of global warming. As the ice retreats, lucrative mineral deposits are exposed. When good intentions meet globalization, uh, I think you know how this turns out. What happens when you put a few Niagara Falls worth of wastewater into Oklahoma's bedrock? Nothing good! The drone war ain't too novel, just a new song in an old tune: victory from the air. Didn't work then, won't work now. Be sure to check out the interactive version that Allison McCann ginned up. Using a proprietary (half-assed) algorithm (excel formula for standard deviation) we ranked sports teams on how good they are at turning payrolls into trophies. Don't even think about beefing with me over where your team ended up. 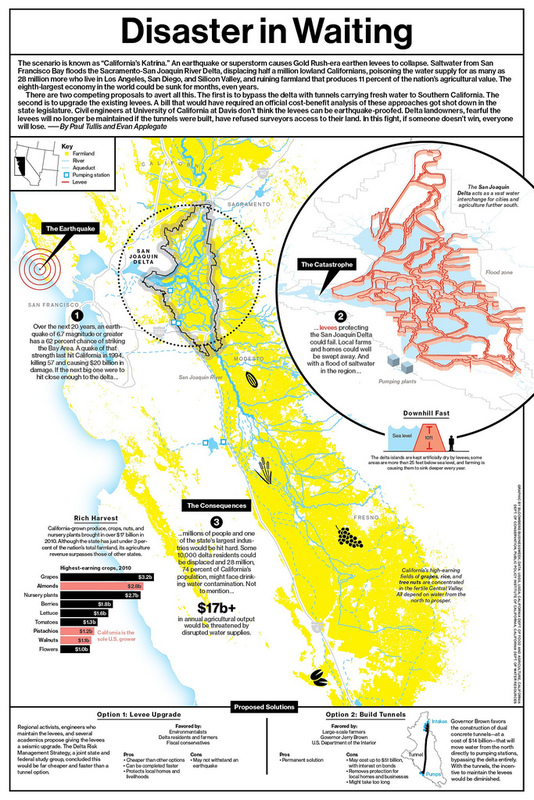 California's one quake away from a big honkin' mess: if enough levees protecting the San Joaquin delta fail, the bay rushes into the state's largest freshwater interchange, and all sorts of agriculture gets ruined. 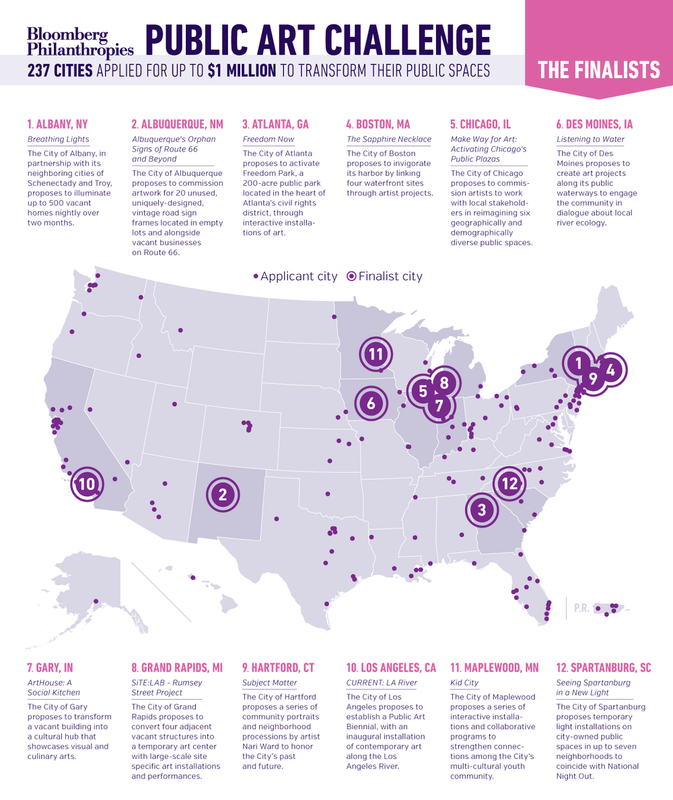 Bonus: proper solutions are cruelly expensive and the state will sit on them until it's too late. The inimitable Robert Young Pelton did a story on Somali piracy for us (back when that was a thing), so I made a map using a neat database provided by the National Geospatial Intelligence Agency. Southwest Airlines says "NOAA's too slow," so they put hygrometers on their fleet. Neat. A Gaza fisherman found a priceless hunk of antiquity, Hamas spirited it away on a child's Smurfs mattress, but what the heck will they do with it? This might be outdated by the time anyone sees it, but remember when ISIS steamrolled through northern Iraq? The 2011 terrorism rundown, the litany of horror you'd expect. 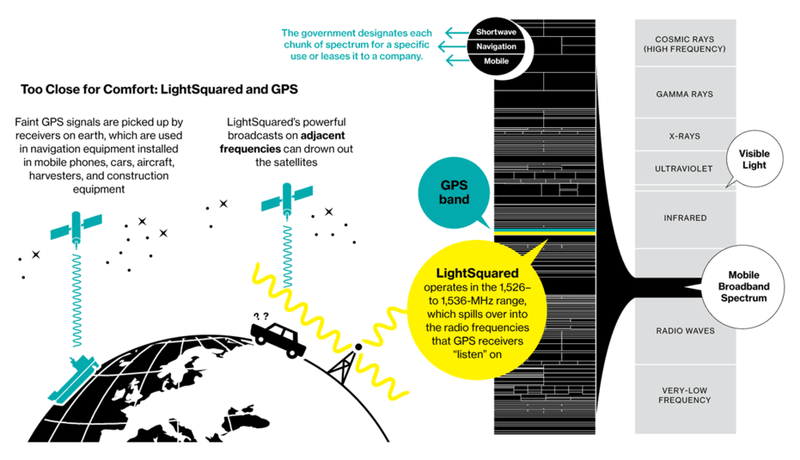 Lightsquared has a narrow chance of interfering with the exceedingly precious Global Positioning System, so the FCC dropped the hammer on them. Natural gas cars are here, but the stations ain't. And sorry NYT, this looks like bald theft but I swear the art director tied my hands when it came to color. Requisite drone strike map. And a cute RPA stat. 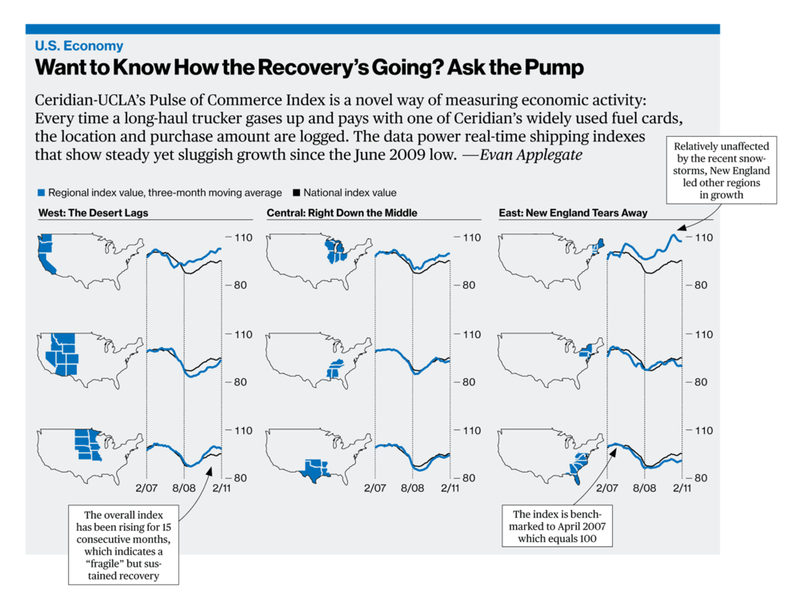 As Tufte as a I wanna be: fill-ups as leading indicator. Iran and Syria's sanction shuffle. Basically they'd never get any new TVs if not for Dubai. 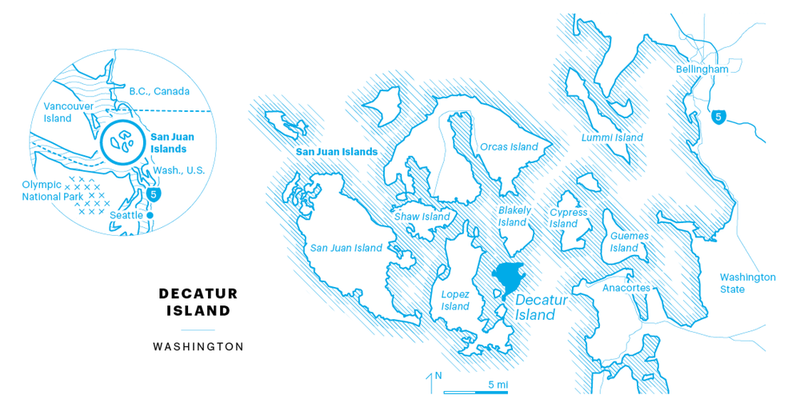 Some maps for Martha Stewart Living's redesign. Totally ripped-off style but still cute. Sovereign debt downgrades, past and present. Fujairah: a less glitzy emirate, but crucially located. "You want to get [your oil through the Strait of Hormuz without the risk of Iran exocetting it to hell]? You talk to me." 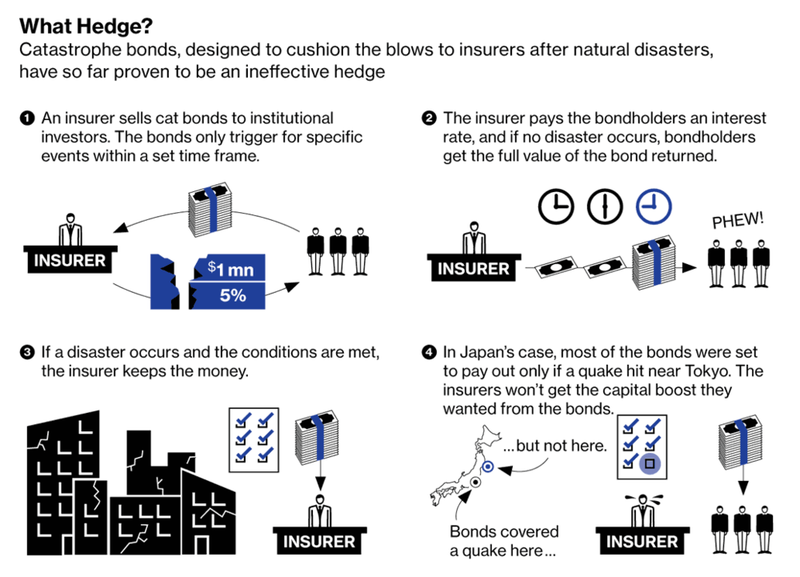 Explaining catastrophe bonds after the Japanese earthquake flattened insurers' balance sheets. East African migrants are regularly brutalized by smugglers; a Somali we profiled was even enslaved for a year in Benghazi. Clutch your passport close. Look no further for the intersection of dank nugs and organic chemistry. Reporting tip: when calling the national poison control center to ask about synthetic cannabinoid overdoses, nobody wants to call back the guy who leaves this message: "This is Evan from Businessweek, calling...about...uh...fake weed?" As in most things, the global south will be disproportionately screwed by climate change. 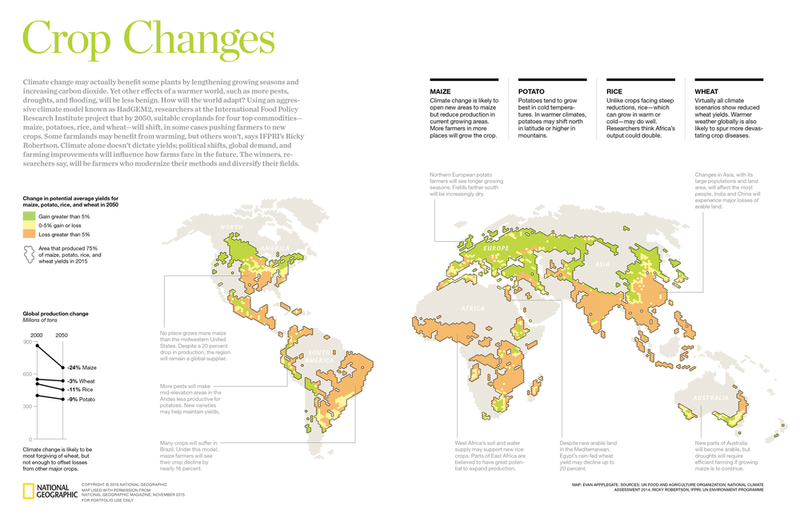 As temperatures rise and precipitation goes goofy the developing world will lose a large portion of their arable land. Quick map of Google's new monstrosity. This time it's different: showing how the unemployed became the perma-jobless with Peter Coy and Jennifer Daniel. Also made an interactive version with Allison McCann. You're a utility, emissions standards close your coal plants, so you're gas-dependent, but not enough therms come down the tube to generate enough for cold winter days. Now your customers are getting gouged to hell and spending fifty bucks to run the microwave. One out of every three times an ISP has to shell out for extra capacity, it's because of Netflix. That's how gaddampt big they are. Freshwater scarcity, poverty, diabetes, and a creeping certainty that the ocean will swallow the whole dang place within a hundred years? Kiribati is one fucked flyspeck. How a new rail corridor speeds cheap goods from China and luxuries from Europe through Russia. There's water in them thar Earth, but not a lot of infrastructure to keep people quenched. Economic water scarcity is where the real paucity's at. Companies bury this in their SEC disclosures, but they lose your personal data all day every day. Done in collaboration with Jake Kouns at the Open Security Foundation. How does the Bureau of Labor Statistics calculate the unemployment rate? Adapted from the original. Making tables is very relaxing. You should try.